Betty at her own wedding. She made her dress from turquoise embossed velvet. Perfect for Betty’s red hair and freckles. “She couldn’t do embroidery, knitting or tapestry, all she could do was designing and making clothes. Anne’s Mum, Beatrice Sykes has always been known as Betty. 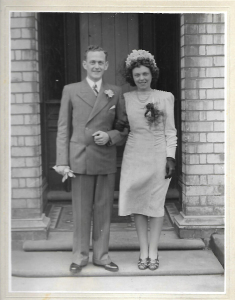 When she married on 25th May 1942 and became Mrs Bartlett, Hull was struggling with beginning of the World War and in the midst of the febrile decimation of the Hull Blitz. It was not an easy war for anyone living in Hull, particularly for the Fire Wardens employed by each business and factory. They were required by law to be installed outside of working hours to watch for incendiaries and fires. A later wedding, when the style for shorter hair and larger collars had become fashionable. Do you know the people in this wedding photo? Get in touch if you do. Until recently Anne was entirely unaware that the sole record about the House Of Mirelle at the Hull History Centre is a card naming Betty Bartlett as the House Of Mirelle’s Fire Warden. This was a dangerous job and the start of war would have kept her very busy. Manned with a bucket, a stirrup pump and keen eyes she joined other women across Hull who followed up their working day by sleeping at their workplace. While the men were away they watched the night sky for bombers and fires that could threaten the City. Betty Bartlett made this wedding dress. Cut in a style reminiscent of the 1930s when draped silk and satin was fashionable, it has long sleeves and a high V neck. Do you know this bride? Get in touch. Albion Street, located slap bang in the centre of Hull, was the location of the House Of Mirelle in its early years. Albion Street was also one of the most heavily bombed areas in Hull. “She used to say that she didn’t know how they survived, now I know why,” says Anne. Being a fire warden was a far cry from the exquisite, fine and defined skills she used by day in the late 1930s and early 1940s. Another Betty Bartlett design. Do you know the wedding party? If you do, get in touch. Employed at the House Of Mirelle, she designed and made clothes for the middle and upper class woman of Hull. “She didn’t like to work from patterns,” Anne explains talking of her mother’s expertise in taking a design to completion. A wedding dress for instance, would have started with a bespoke pattern created entirely from an individual’s measurements. This is a skill dressmakers, fashion designers and couture houses use to this day. Following the social convention, Betty left the House Of Mirelle after she got married. She worked in Durham for the war effort but her skills as a dressmaker were in constant use in the years afterwards. She designed and made clothes for people from all over Hull, often for special occasions like weddings. Some of the designs are seen in from the photographs that her daughter has kept in a special box since her passing away. Bride and bridesmaids wear matching outfits with a sweetheart neckline trimmed with bows. Which wedding is this, and when did they wear such glamorous, beautifully made outfits? “I wish I’d kept a record of who everyone was,” said Anne, “but you know how it is when you are a child. Anne’s friend Lynne Devaney is one person Anne doesn’t have to search for. Her Mum, Mary Ashton married the love of her life, Ronald Ineson at St Alban’s Church on 23rd September 1950. The wedding of Mary and Ronald Ineson, 1950, taken at the wedding reception. wedding dress and going away outfit, the traditional wedding outfits for that era. Married in white, the dress had a lace jacket with a peplum waist and long skirt. Her going away outfit was what was called a ‘costume’ during the war years – a skirt suit. Mary and her new husband, Ronald Ineson. Going away outfit designed and executed by Betty Bartlett, Hull. Clothes rationing was still in place in Britain in 1949 and food rationing remained in place until 1954. Her mother would have had to save up coupons as well as the cash to make the clothes and provide the food at the wedding. This was a sign of how important the day was for her. Many women decided against following this tradition for weddings happening under the restrictions of post-war rationing. “Minnie, She was lovely.” Anne loved this photo and looked at it fondly when she was a child. Which Minnie is it – she comes from Durham and liked tap dancing. If you know, please get in touch. As we continue to look through the photos, Anne talks about a women standing on church steps and smiling, wearing a wedding dress Betty also made. I mention the halo hat her mother is wearing which was the height of fashion in 1939 and 1940. As I look closer it becomes unclear to me whether one particular photo is of the same wedding, as the bouquet Betty is carrying is different between the both. There’s a pause while both of us think. “Look at the bouquet she is carrying!” says Anne, all of a sudden. “It’s the same one that the bride is carrying. We take a moment to absorb this information, seeing in the photographs a story from the day that her Mum hadn’t shared with her daughter. Betty Bartlett’s last outfit: her daughter’s wedding dress. 21.9.1974. “The last dress she made was mine,” Anne says. “I can’t believe this is happening now, especially when she would have been 100 years old in April,” she says, whistfully. Betty designed and made the bride’s and bridesmaids’ outfits. Can you help Anne identify who it is wearing Betty’s designs? If you do, contact us to let us know! Anne and her new husband Stephen, 21st September 1974. The Tudor style and detail of the gown is shown in the long sleeves and train, flowing from her arms beautifully. © House of Mirelle 2016. Previous Post Fashion trends then and now: Leather in 1953, Leather in 2016.